Is fear of the dentist preventing you from getting the care you need? Trust your sedation dentist in OKC, Dr. Joe Isaacson and his associate dentist, Dr. Ashley Bledsoe Cook. More than simple pain shots, sedation dentistry options help you relax and get your dental work done in comfort and without anxiety. Who is Afraid of Going to the Dentist? Studies indicate that a full 10 to 15 percent of adult Americans fear dental visits–some so much that they postpone treatments, or worse, stop going altogether. That amounts to millions of people neglecting preventive care and the restorative services they need for healthy mouths, strong, beautiful smiles and vibrant overall health. Why is Dental Phobia So Prevalent? There are many reasons for dental anxiety. The dedicated team at Joe Isaacson Dental takes them all very seriously and works to find just the right solutions. These factors combine for extreme nervousness evidenced by a racing pulse, sweaty palms and a feeling of dread. 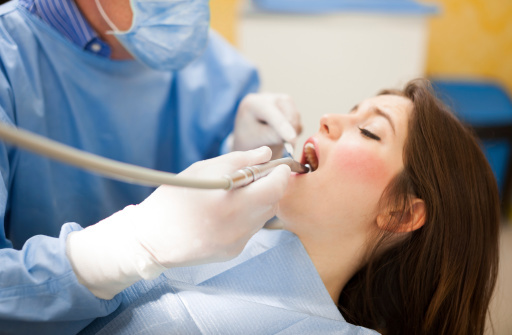 What are the Advantages of Sedation from Your OKC Dentist? Dr. Isaacson takes great care to make his dental practice a warm, welcoming place. A patient-centered philosophy eases individuals through their appointments. Dental sedation goes a step further. It calms patients no matter how complex their treatments are. From cleanings and fillings to root canal therapy to emergency care, sedation dentistry ensures a reliably comfortable experience. What Kinds of Sedation are There? Besides local anesthesia, your dentist offers nitrous oxide (laughing gas) and oral conscious sedation. The staff is fully trained in monitoring patient vital signs and levels of consciousness when using these medications; so you know treatments will be completely safe. Nitrous oxide, or laughing gas, has been used for decades by dentists. Administered via nasal mask, nitrous oxide may be turned up or down during the dental treatment as needed. While under the influence of nitrous oxide, patients feel happy and even euphoric. This medication wears off quickly after treatment. Patients can drive themselves home. Oral conscious sedation is basically a tranquilizer such as Valium, Ativan, or Versed. They allow a patient to relax and even nap during dental work. People awaken easily and must get a ride home from a loved one or friend. Many individuals experience amnesia about their dental work. Are You Ready to Stop the Fear? Award-winning dentist, Dr. Joe Isaacson, encourages you to pursue good oral health. Sedation dentistry can help. Contact Joe Isaacson Dental to arrange your personal consultation.